To have a great tank, you have to pay attention to much more than just the quality of the water; you need to know the ideal temperature for your fish and that you have the right heater. Fish cannot produce body heat naturally, so they will not be able to survive if the water is not the right temperature; even a few degrees can make the difference between healthy fish and sick ones. No matter what kind of heater you choose, you must have a thermometer in the tank at all times. Also, a timer can be of assistance if the heater does not have one of its own; there are moments when you need to let chill the water by itself and you don’t know if you will be there to unplug the heater. What kind of heater do you need? There are four general types of heaters, but you will find new devices on the market every day. This is an investment for the next few years, so do not make this decision without researching and visiting various stores. The immersible heater is extremely common due to its inexpensive price, but it is not always efficient. It does not produce enough heat to work well with big aquariums. Also, the upper part of the heater needs to remain above the water and it can be broken easily if you sink it by mistake. If you have no other alternative, you can hang the immersible heater on the side of your tank; however, make sure to check the temperature constantly. Submersible heaters can be kept completely under the water, so the heat will not be wasted. The price can be higher than the immersible ones and there are more risks. Some of them are made from glass, which can be a huge problem if you have active, large fish. The ones made from unbreakable materials last longer, but they use more energy. 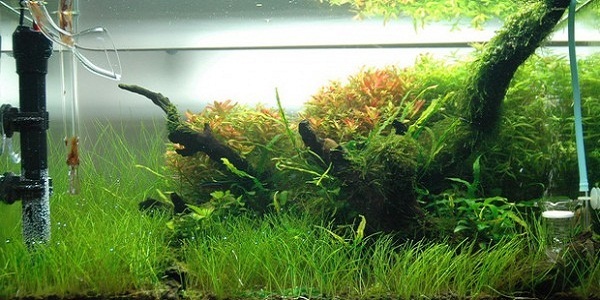 A substrate heater is what you need if you are passionate about aquarium plants. Basically, you will not see the heater in the tank since the heating cables are hidden under the substrate and they distribute the heat from the lower part to the rest of the tank. It will help your plants grow in only a few weeks and you don’t have to worry about the fish damaging the heater in any way. The disadvantage can be the fact you have to remove everything from the tank in order to install it. 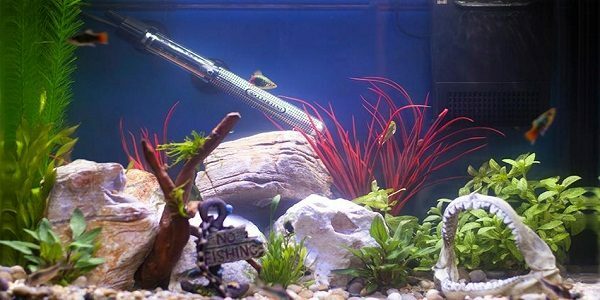 If your aquarium is already set up or you have a lot of plants and fish, this type of filter can be tricky to install, but it is worth the effort. As for the price, it depends on the quality of the heater and the manufacturer, but in general these types of heaters are affordable. Filter heaters are relatively new on the market, but they gained popularity very quickly. You don’t have to add any extra equipment in your tank and you will not use more energy than usual. By placing a heating block inside the filter, it will warm the water while filtering it. In the long term, it is the ideal solution for your tank, even though you may go over your budget to retain one. It is important to pay attention to the kind of filter you have when purchasing this type of heater since older model filters might need to be upgraded in order to insert a heating block inside. If you have a substrate heater, you cannot place it wherever you want since it must be placed under the substrate. On the other hand, you have complete freedom with the other types of heaters. In general, it is recommended to place the heater next to the filter and/or in front of the water flow. In this way, the water will warm faster and the heat will be distributed equally in the entire aquarium. Take into consideration the fact that one single heater might not be enough for your entire tank, especially if it is over 40-50 gallons. In this case, two moderate heaters can be placed in different parts of the tank. To be ready for anything, you should also have a spare heater in the house in case the current one breaks; if it cannot be replaced for a few hours, your fish might have great problems. Once you have the right heater for your aquarium, just set the right temperature using a timer and enjoy your aquarium.